This is how the FBI can consider everyone liking his/her online privacy. Katitza Rodrigez was depicting very finely and accurately the current state of privacy fights right before International Privacy Day. The latter was just few days ago, on 28th January. 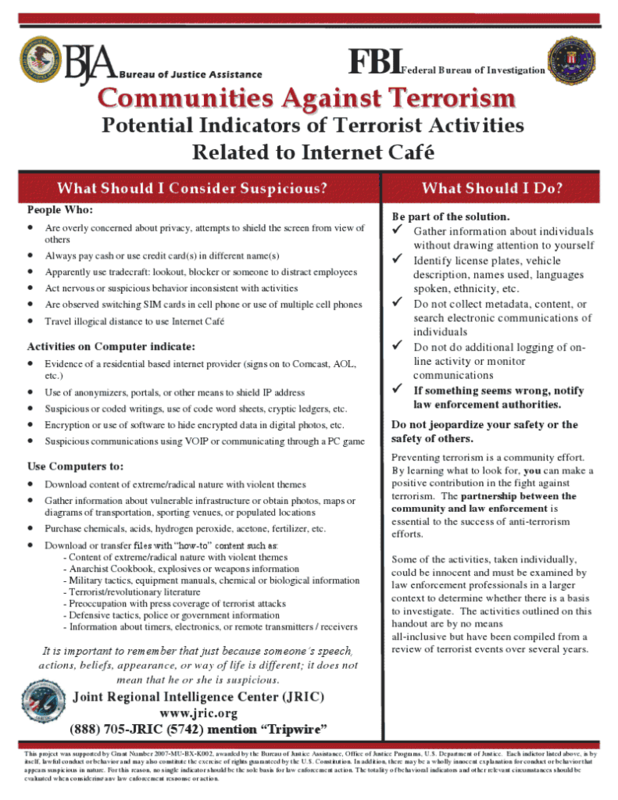 And here comes the FBI now with a very interesting and precise flyer telling people how to spot a terrorist. As you can see it, any use of “anonymizers, portals, or other means to shield IP address” is considered as a suspicious activity such as terrorism. Additionally, if you use encryption or are somehow “overly concerned about privacy” or attempting to “shield the screen from view of others”, you are suspicious of being potentially engaged or supporting terrorists. This means that using a proxy or the Tor network makes you automatically suspicious. This puts you in the same basket as a woman wanting to remove her nail polisher who buys some acetone or the cute granny from the house around the corner buying fertilizers for her lovely petunia. Who is next? The EFF for promoting HTTPS Everywhere, the guys from the Tor project for providing a tool to protect your online privacy or myself as any security-conscious employee for using a VPN to connect from home to my computer at work in the week-end?